Retailers everywhere would be remiss if they did not find ways to enhance the natural human tendency to make impulsive decisions. The idea is to pinpoint the products that consumers need on the spot or a need they may have forgotten about. Consider a rainy day and John Doe is perusing the aisles at a local pharmacy; he's there initially to pick up his medication. He didn't consider the weather because it was sunny when he left. Well, good thing that store has cheap umbrellas available to him right then and there. A person seeing batteries may remember they have a flashlight not working at home or a smoke detector that has started beeping. These are product needs that the customer didn't realize they had until they entered the store. The other consideration for impulse products are things that help daily life. We likely didn't come in with a plan to purchase these items, but the sight of them creates a desire to consume: a flashlight key chain, energy drink, night light, air freshener, pocket knife, reading glasses, phone chargers and cases, extension cables, sun screen, insect repellent, moisturizer, shoe sole inserts, mints, toothpicks, eye drops, and entertainment like magazines or books. Gift cards should also be near the checkout. You need to focus on accessories or enhancements to your main products. If you sell shoes, then shoe laces, socks and leather cleaners should be at the checkout. Most food retailers have sweet snacks by the counter and drinks. You need to determine which products create added value to your main products. Once you've categorized the products that fill the needs and wants of your customers, the name of the game becomes placement and pricing. Is the product on the lowest shelf, the highest shelf, or at eye level? Is it placed right at the register or where customers would be waiting in line before the register? Is it placed at the ends of aisles or high traffic areas? Is it placed by the entrance door so customers start thinking about them upon entrance, and may get them thinking about related items they need to buy? Is the product at a reasonable price point, usually under $10? After you have decided on the items and placement, you need to draw attention to those products. Take advantage of upcoming events and holidays to change up your displays and impulse items. 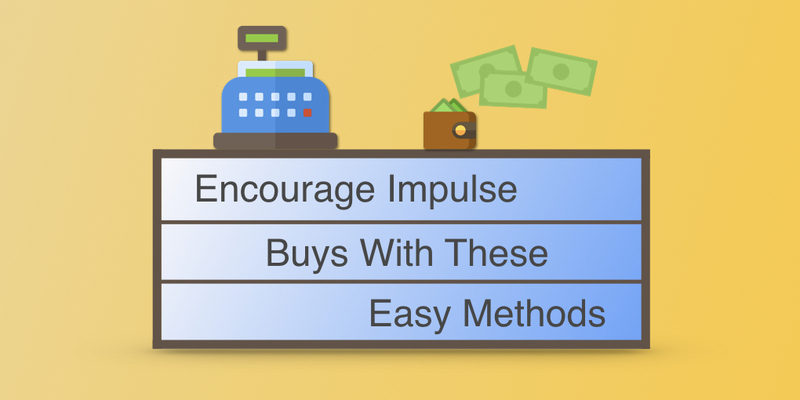 Placing impulse buys around your shop isn't a ground-breaking idea, but this retail practice can greatly boost your overall revenues and profit throughout the year.